Whether you are getting your house ready for the market or creating a dream kitchen in a home you just bought considering a major kitchen redo is a major project and expense. Here are tips and trends to help you. The cost of redoing a kitchen is on the rise, averaging $109,000 for an upscale renovation and $55,000 for a mid-range transformation, according to the 2014 Cost vs. Value Report. 2. LED lighting. Because it’s been mandated by certain states and the federal government has required that incandescent lamps be phased out unless sufficiently energy efficient, more professionals and home owners are making the switch to energy-wise LEDs underneath cabinets and in cans, pendants, chandeliers, and sconces. 3. 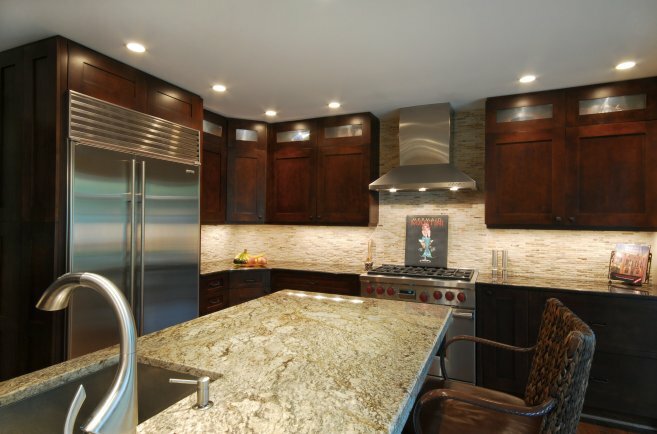 Backsplashes have become a major focal point. Subway tiles are still popular, though now with beveled edges; matte rather than glossy finishes; a variety of colors rather than just classic white; and in larger 4-by-10-inch formats rather than traditional 3-by-6-inch sizes. Today’s trend is also to lay the tiles in vertical rather than horizontal rows. Bigger glass tiles in shimmery hues are grabbing attention, too—and they represent a green choice, made out of recycled materials. 4. Drawers beneath countertops rather than doors. Rather than have to go through a two-step process of opening below counter cabinets and reaching into and rummaging through shelves, drawers that pull out and present all their contents are taking hold. The one downside: These shelves aren’t adjustable as are those in many cabinets. 5. Appliance trends. Options, options and more options are available in today’s high tech kitchens. Here are a few to consider. * Microwave drawers that are easier for all generations to reach than those placed above a range or cooktop. * More powerful gas range burners that offer higher output. *French-door style refrigerators that make it easier to view contents when doors are opened, they’re now available from some manufacturers with four doors. * Hot-water dispensers on refrigerator doors. * Beverage centers and wine coolers that are placed strategically at points of use. * Dishwashers that have three and four racks for silverware and utensils; also, models that use less water, are quieter and bigger, and place jets along side walls. * Integrated appliances, better camouflaged behind panels to dress up open-style kitchens. *Long, deep, one-bowl sinks, sometimes with cutting boards to conserve space. 6. Cleaner, contemporary lines. Styles fade in and out, typically following suit with fashion trends and the economy. This year, home owners are gravitating away from traditional and even eclectic designs, instead opting for streamlined, modern looks. This preference is showing up in less-ornamented cabinet fronts, sometimes with a flat door or minimal molding and simpler hardware. Trends also include less exotic countertop patterns, simpler floor choices such as wood planks or bigger tiles with less grout, and pared-back color palettes.